When you put on a shirt and tie, you might not have given any more thought to them, other than does this tie go with this shirt? But did you know the shape of your shirt collar can have a big impact on how your face and upper body look? And the choice of tie you should pick to go with each one? 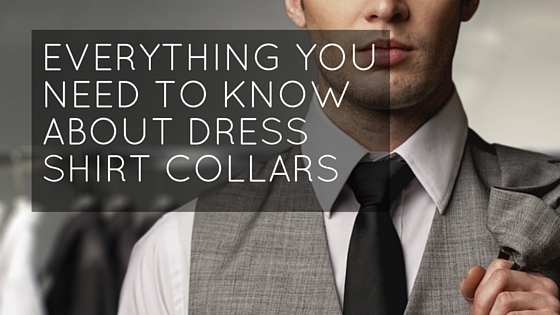 This blog will tell you everything you need to know about dress shirt collars. This type of collar is very popular is also called a forward point or a straight point collar. It should ideally be worn with a tie for maximum impact, and due to its shape and its elongating properties it’s an ideal choice for round faces as it will help to lengthen your face and bring you more in proportion. The right knot for your tie here is called the ‘four-in-hand’ and it’s the most common type of knot (you probably wore your tie to school like this). This shirt collar is excellent if you are wearing a tie with a Windsor knot, and for men with wider necks, again as it will bring you more in proportion. Learning how to tie a Windsor knot may take a bit of practice, but as it’s the most searched-for tie technique on the internet, you won’t have trouble finding a tutorial or two. A button down shirt has traditionally a more sporty and casual feel, however it can still be worn in a business setting. You can wear this style of dress shirt collar with or without a tie, so it’s a very versatile addition to your wardrobe, however if you are wearing a tie with this style, a half Windsor is the knot for you. Widespread collars as the name suggests have a wider spread between the two collar points, and as you might think this opens out the shirt and draws attention to the area, so it’s a shirt collar for adding a bit of drama (and not for the faint of heart). It’s a good choice for narrow faces or long necks as it helps to balance your frame. Cutaway collars reveal more of the upper shirt area, and therefore when wearing a tie you will need something like the full Windsor knot to fit this space without leaving unsightly gaps. This is also known as a club or a golf collar, and is a less common dress shirt collar so don’t panic if you don’t have many of these in your wardrobe. It was traditionally worn to signify exclusive memberships – but has more of an Eton boarding school-feel about it.